BelarusDigest > All > Belarus-EU Relations: Reaching the Limit? 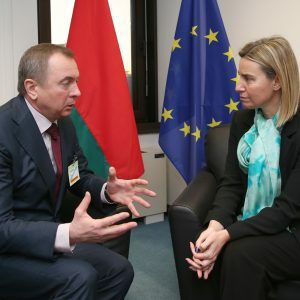 Belarus-EU Relations: Reaching the Limit? Recently Belarus was considered a relative success story of the Eastern Partnership – no territorial disputes, no broken promises, only gradual positive dynamic in relations with the European Union (EU). However, the intensity of Belarus-EU cooperation seems to have reached its limits. The lack of further progress in the human rights arena and dubious plans of Belarusians officials on electoral reform harm the relations. Announcing the Foreign Ministers' meeting on 23 May, the EU External Action Service listed achievements in building ties with Eastern neighbours: functioning association treaties with Ukraine, Moldova and Georgia, foreseen agreements with Armenia and Azerbaijan and “evolving relations” with Belarus. Such vague phrasing indicates the general slowdown in the Minsk-Brussels re-engagement. This trend was also noted during Alexander Lukashenka's visit to Rome on 20 May – the first EU trip after lifting of sanctions. Unlike seven years ago, this time he did not meet with the Prime Minister of Italy. Just as in 2009, when Minsk got brief sanctions' relief, Lukashenka went to Rome as a first destination point. In fact, both – Italy and Vatican seem proper places to serve as "gates to Europe" for the Belarusian leader. Italian leadership has always been one of the major advocates of pragmatic (some argue – cynical) approach to Belarus. Until recently, two countries had sizable trade – up to 2 bn Euro a year. However, it has fallen threefold in 2015, primarily because the price of refined oil products and potash fertilisers have drastically declined. Meeting the Pope, in its turn, gives Lukashenka some sort of moral clearance; it is supposed to wind down his "non-handshakeble" image in the West. The meeting in Vatican went almost perfect – the Belarusian leader and Pope Francis exchanged gifts, the latter called Minsk "the place of peace" and Lukashenka said he and the leader of Catholic Church share common vision of the world. The Pope even received an invitation to Belarus, for a meeting with the Russian Orthodox Patriarch Kirill. This long-held Lukashenka's idea will unlikely come true: two senior clerks have recently met in Cuba for the first time in history; there is no reason to repeat this unique event anytime soon. Regarding Italy, in contrast with 2009, when Lukashenka held talks with Prime Minister Silvio Berlusconi, now he met just with President Sergio Mattarella. The president in Italy lacks real power and his position is purely nominal. It looks like political leadership of Europe still finds it either inappropriate or unnecessary to meet Lukashenka. The developments of recent months show a mixed picture of Minsk-Brussels relations. On the positive side, a Belarusian-EU investment forum took place in Austria on 24 May. Minsk has sent a high-level delegation, chaired by Deputy Prime Minister Vasil’ Matsiusheuski. More than a hundred companies from both sides came to Vienna to discuss Belarusian investment opportunities. It remains to be seen how fruitful this forum will become in terms of actual contracts, but such event is already an achievement. On the other hand, despite the ongoing discussions with the EU and the UN, Belarus continues to practise the death penalty. Courts have already sentenced three people to death in 2016. Another man Siarhei Ivanou was executed in April. After the latest death sentence announcement on 19 May the EU issued an unusually harsh statement. Brussels accused Minsk of breaching its commitments to engage in dialogue with the international community on this issue and to consider a temporary moratorium on death penalty. During his visit to Brussels on 23 May Foreign Minister Uladzimir Makei also reiterated the Belarusian proposal to negotiate a basic treaty with the EU – a framework document that Brussels has with almost every post-soviet state. Still, European officials either remain silent on this initiative or, like the head of EU delegation to Minsk Andrea Wiktorin, say, “the time has not come yet”. After sanctions relief, Brussels obviously views the upcoming September parliamentary elections as a litmus test for Belarusian authorities. Lukashenka knew that and ordered Central Electoral Commission to come up with something he can offer as a concession to the West. Head of CEC Lydzia Yarmoshina announced that electoral legislation would remain the same because of “the shortage of time before the elections." However, the CEC promised to adjust some practises to make the process more transparent. It includes letting observers closer to the ballot counting tables, providing them a clear view, giving slightly more rights to international observers, publishing more online data about elections and making local authorities publicly debate each candidacy when composing district electoral commissions. Needless to say, these cosmetic changes address only a few of 30 recommendations OSCE made after last presidential campaign. Kent Harsted, who headed short-term observers’ mission on 2015 presidential elections, told TUT.BY the OSCE expected legislative changes and had already heard many promises from Minsk. Members of European Parliament, who visited Belarus recently, complained they “did not get comprehensive answers” to their questions from Yarmoshina about planned electoral changes. Other areas of dialogue like mobility partnership or visa facilitation talks (lasting for 2,5 years) also lack visible progress so far. 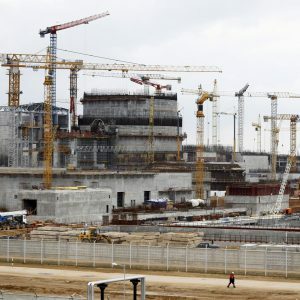 In addition, Lithuania does it best to raise its concerns about Atravets nuclear power plant to the level of political dialogue between Belarus and the EU. Makei discussed this issue with the Vice-president of the EU Comission Maros Sefcovic in Brussels, which suggests that Vilnius' efforts have achieved certain progress. It might additionally burden the Minsk-Brussels dialogue in the future. Recent developments in Belarus-EU relations indicate a degree of mutual disappointment. Brussels expected more readiness to human rights improvements from Minsk. Belarusian authorities hoped to get tangible carrots from the EU sooner. In his recent state of the union address, Lukashenka described the current stage of Minsk-Brussels relations as “a talk-fest”, meaning too many negotiations with little outcome. If this trend continues, the future of the Belarus-EU thaw will likely depend on the parliamentary elections. In case the campaign follows the usual scenario or with only cosmetic procedural improvements, the EU might lose its remaining enthusiasm and curb further attempts to engage Belarusian authorities. On the contrary, some visible progress – such as more inclusive composition of electoral commissions, transparent ballot counting or letting the opposition into parliament – might give the re-approachment with the West a second breathe. 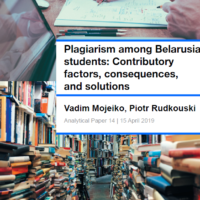 However, knowing the Belarusian authorities’ attitude towards democratic procedures, their deep-held fear of political experiments, the first option seems more feasible. Only serious quarrel with Moscow or truly deep economic downturn can make Lukashenka more inclined to establish new concessions with the West. Estonia and Latvia halfheartedly supported Lithuania’s initiative. However, Finland refused to join in the boycott. Poland hid behind a soft diplomatic formula affirming that “energy from unsafe NPPs should not get on the market”.